The Los Angeles Lakers are the biggest franchise in the history of NBA. They have reached a record 31 NBA finals and won 16 NBA championships. The Lakers hold the distinction of the franchise with the most number of Hall of Famers playing for them. The top four scorers in NBA history have all played in the Lakers uniform at some point in their career. 5 out of the top 6 scorers have played for the Lakers. So, it is pretty evident that a lot of legends have graced the purple and gold uniform. Wilt Chamberlain, Jerry West, Magic Johnson, Kobe Bryant, Shaquille O'Neal and now LeBron James are some of the revolutionary players that have featured for the Lakers. The Lakers have struggled in recent years but still have 5 NBA championships since 2000. Derek Fisher was one of the most important players for the Lakers during the dynasty years. 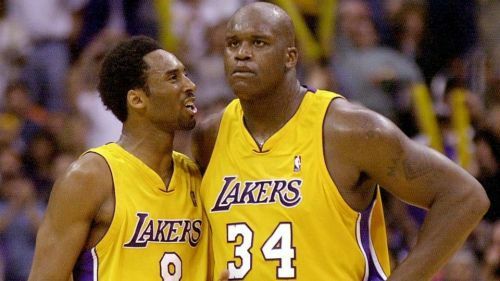 He was a very viable number three option behind Shaq and Kobe and became a fan-favorite. Fisher holds the record for the most number of playoffs games played and has a historic moment in the playoffs to his name when he hit a buzzer beater in the game 5 of the Western Conference semifinals against the San Antonio Spurs. Fisher played in 8 NBA finals, 6 of them with the Lakers. He won 5 NBA championships with the Lakers. 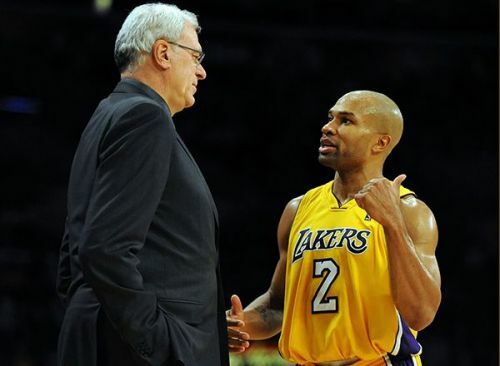 Fisher was one of the silent superstars of the Lakers team and was given the responsibility to run the triangle offense as the Point Guard of the team. Fisher was a blessed and a clutch three-point shooter.